The inside of the tea bowl bears a small print of a tree growing on a rock. It is said that this is a palmetto, a type of small palm tree that is native to South Carolina. This tea bowl is an example of the very rare group of bone ash softpaste porcelain, made by John Bartlam at Cain Hoy near Charleston between c1765-69. 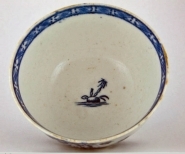 This is now recognised as the first porcelain to have been produced in America. Bartlam had left Staffordshire about 1763 to travel to Charleston with the object of setting up a pottery. Shards of porcelain excavated at Cain Hoy are decorated with the same underglaze blue prints that are seen on one side and inside this tea bowl. This pattern, which is not known on the porcelain of any recognised English factory, has now been identified on four tea bowls. Interestingly, these have all come to light in England. However, it is known that Bartlam returned briefly to England in 1769 to seek potters for his factory and he may well have brought examples of his porcelain with him.